(Piramida Sunca) Dr. Sam Osmanagich, Ph.D. and Lead Excavator Edo Građan explore a newly discovered open tunnel in Ravne Tunnel Labyrinth on July 6, 2017. Most new tunnels in Ravne Tunnel Labyrinth were filled in to the brim with "fill-in material" (loose sand and small river stones) an estimated 4,600 years ago by an unknown advanced cultures. The tunnel discovered and explored on July 6, 2017 was not filled but is open, traveling north-south. "Dr. Sam Osmanagich, Ph.D. explains Archaeological Park Foundation's open information policy"
"New LIDAR Scan of the Bosnian Pyramid Complex Proves Dr. Sam Osmanagich Right — and Proves Dr. Robert Schoch, Zahi Hawass, Archaeology Magazine, and Wikipedia Wrong"
"The Mysterious Anti-Scientific Agenda of Robert Schoch - Part 1: The Bosnian Pyramid Complex"
"Megasphere: The Stone Ball that Wouldn’t Roll Away: Archaeology Magazine Ignored the March 2016 Discovery of the Most Massive Stone Sphere in the World . . . But It’s Still There"
In Sarajevo, Visoko and Zavidovići from June 15-22, 2017, there was a traditional conference, tour and summer solstice festival, organized by the “Archaeological Park: Bosnian Pyramid of the Sun” Foundation. The host of the program was the discoverer of the Bosnian Pyramids and the Director of the Foundation, Dr. Sam Osmanagich and the entire team of employees and Foundation associates (Sabina, Lejla, Sandin, Ajdin, Dženana, Nataša, Haris, Salko, Mustafa, Nermin, and others). At the Conference on Bosnian Pyramids the presenters were the pyramid explorer Dr. Sam Osmanagich (“Energy of the Bosnian Pyramids”), the pyramid constructor Valery Uvarov from Russia (“The purpose of the pyramids”), researcher of the Tesla Waves Goran Marjanović from Serbia (“Scalar Waves at the Bosnian Pyramid of the Sun”), pyramid manufacturer Ken Rohla from United States of America (“Phenomena of scalar waves on pyramids”) and ancient mysteries investigator Patrice Marty from France (“Origin of elongated skulls – the ancient mystery”). The presentations took place at the conference hall of Hotel “Park” in Sarajevo. Hundreds of visitors were listening to these interesting presentations which are showing the latest accomplishments in the science of pyramids and ancient mystery analysis. Hundreds of interested participants arrived in Bosnia-Herzegovina to broaden the knowledge on the pyramid energy. They arrived from 17 different countries: Singapore, USA, Australia, Canada, Argentina, Spain, Great Britain, Netherlands, Belgium, Switzerland, France, Slovenia, Croatia, Serbia, Germany, Austria and Sweden. They all left impressed from Bosnia-Herzegovina after the visit to the world’s oldest and greatest pyramids, prehistoric Underground Labyrinth Ravne and stone spheres in Zavidovići. At the “Archaeological-Touristic Park Ravne2” there was the first Summer Solstice Festival from June 19-21. The Festival participants were: “Hare Krishna” Band from Sarajevo, Ensemble “Vibrica” from Zagreb, Croatia; from Slovenia: Leon Levstik, Tibetan bowls, Rok Rotar, crystal bowls, Bostjan Kragl, great gong, Naser Omeragić Naki, guitar, Marina Trost, singer, the AutE music group composed of Uroš Jezdić, accordion, Klemen Bračko, violin, and Eva Jurgec, oboe and beak flute. The closing Festival performer was a Turkish soul singer Seda Bagzan with the ensemble. The reactions at the Festival were extraordinary, and hundreds of visitors from dozens of countries enjoyed the relaxing and spiritual atmosphere created by the artists. 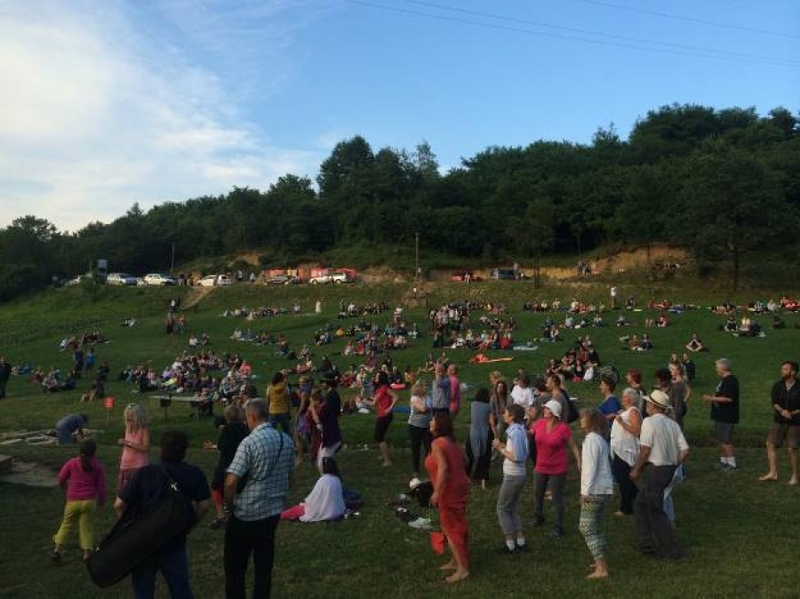 The organized groups came to Visoko for the Summer Solstice Festival from the following countries: Germany, Netherlands, Belgium, Slovenia, Bulgaria, Macedonia, Croatia, Serbia, Hungary, Finland and others. At the Park “Ravne 2” there was a three-day, commercial Fair of minerals, crystals, fossils, rocks, semi-precious and precious stones in an organization of the Society of mineral enthusiasts “Gorski Kristal” (“Mountain Crystal”). As the part of the Conference program, there was a screening of two extraordinary feature films on Bosnian Pyramids by the Bosnian-Canadian author Vinko Totić and Austrian director Alex Dolphin. After the screening, the authors answered the questions posed by the audience and sold the DVD's with the film in the English language. In this year, during the days of the Conference, the authors started filming three new documentaries on the subject of the Bosnian Valley of Pyramids. The first is by the British Director Susann Griffith Jones, the second film is by the Bosnian-German author Said Sefo, and the third is by the Belgian Academy graduate Sacha Ferbus.